Most parents are aware of the staggering number of children and adolescents affected by firearm violence in the United States. What parents may not realize is that in the United States, one out of every three homes with children has a gun, and that many of these firearms are kept unlocked or loaded. Every year thousands of children and adolescents are killed and injured as a result. In response, we want to bring to your attention The ASK (Asking Saves Kids) Campaign. This movement promotes a simple idea that has the potential to help keep all kids safe. The Ask Campaign, created in collaboration with the American Academy of Pediatrics, encourages parents to ASK if there is an unlocked gun in the homes where their children play. Parents ask all sorts of questions before their children visit other homes. They ask about pets in the house, discuss allergies, and ask questions about supervision. 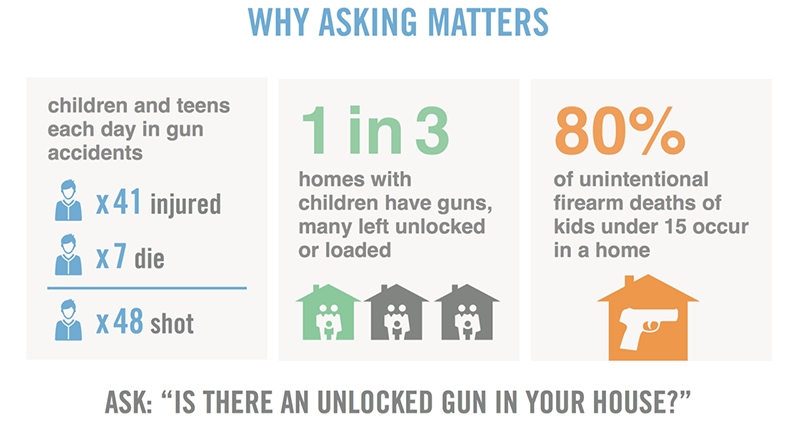 ASK encourages parents to add one more question to this conversation: “Is there an unlocked gun in your house?” It’s a simple question, but it has the power to save a child’s life. For more than a decade, the ASK Campaign has partnered with over 400 grassroots organizations to spread its message in neighborhoods nationwide. It has successfully inspired an estimated 19 million households to ask if there are guns where their children play. For more information on the ASK Campaign, and to pledge to ASK this life-saving question, please visit www.askingsaveskids.org pledge. At this site you can also learn about more ways to get involved in ASK, and how you can spread the ASK message in our community. Remember, Just ASK: It is the best way to protect your kids from guns outside your home.